Sheshunoff's Trust Department Policies and Procedures manual offers the trust manager a comprehensive action plan for implementing and maintaining trust department policies and procedures that will protect the interests of both the bank and the bank's customers. 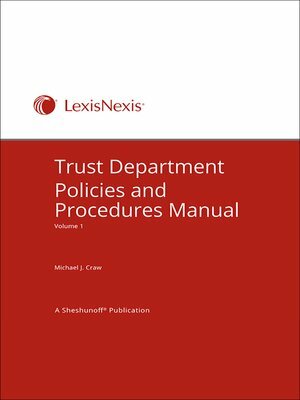 With this manual as a guide, the trust officer can avoid costly mistakes and common compliance violations. More than 200 policies and procedures provide the critical internal controls necessary to achieve an institution's strategic objectives, maintain regulatory compliance, and effectively manage risk in the trust department.